I've mentioned my feelings about Gari Garikun on my other blog. I find him one of the more disturbing mascots. His enormous maw makes me want to go through the freezer case and turn all of the boxes around and it certainly dissuades me from making a purchase with his visage on the package. That being said, apparently having a mouth that big creates an enormous gravity well into which bits of food are sucked so there is some sort of benefit to such a deformity. 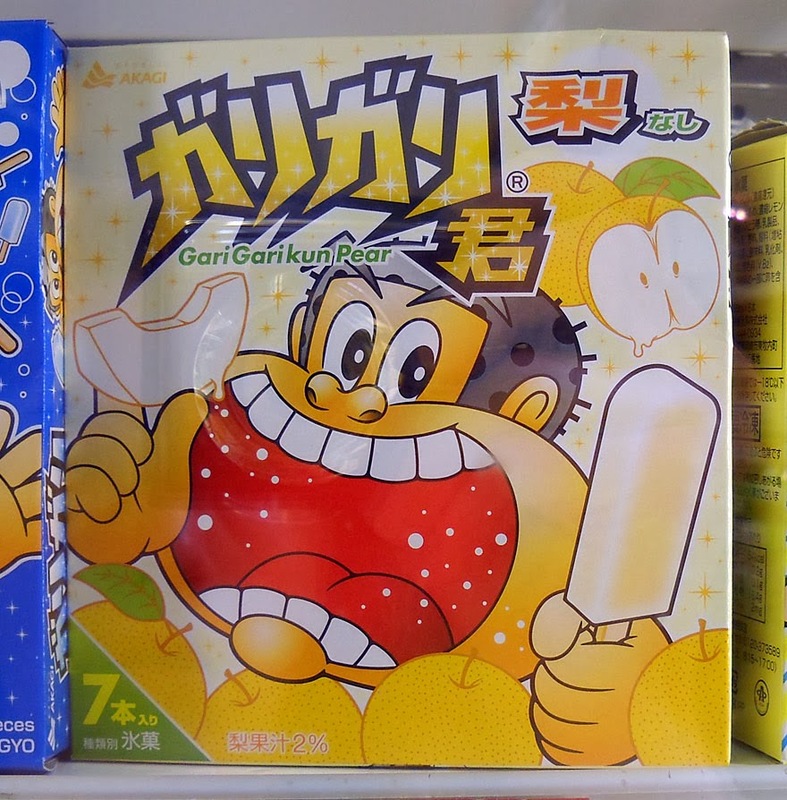 At any rate, this is a nashi pear (Japanese/Asian pear) flavor ice pop. It's an interesting flavor option, but it says only 2% of it is pear juice so you're mostly getting sugar and water. Hello again! :) been a long while since I've visited (I'm currently doing my bachelor's thesis so time has been scarce) but I'm thrilled to see a good number of interesting new posts! It's quite a thing to learn about how certain less conventional mascots actually pull a number of people into buying the product or at the very least, do not manage to repel them. It's either the consumers are not entirely affected by the packaging or that must be one tasty ice pop. The texture of garigari!! loved it!